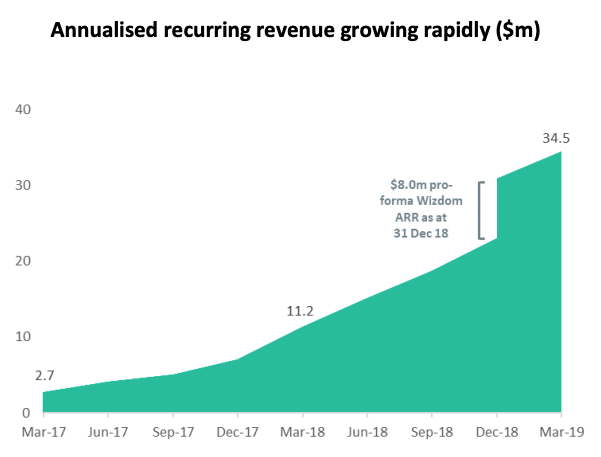 LiveTiles (ASX:LVT) has announced further continued growth of its annualised recurring revenue (ARR). This March quarter it has reached $34.5 million – up a staggering 208 percent on the prior year from $11.2 million. The growth of the revenue was driven by organic growth and its acquisition of digital workplace software business Wizdom, completed in February 2019. The March quarter is usually a slower quarter in terms of enterprise software sales according to the company and it is delighted with the organic growth of $3.6 million that was achieved this quarter. New clients have come on board across the United States, Australia, Europe and the United Kingdom. They include leading financial services firms, a real estate group, a number of government departments and agencies and one of the world’s largest pharmaceutical companies. The company boasts a “strong sales pipeline” that it hopes will continue to deliver customer and revenue growth in FY19. “We expect to deliver another year of strong revenue growth in FY19, driven by our investments in sales and marketing, the 2018 launch of our AI products, high-impact co-marketing initiatives with Microsoft plus a strong organic growth contribution from Wizdom,” said Redenbach. Multiple cross-selling opportunities have been added and new customer opportunities to capitalise on with the addition of Wizdom earlier this year and Hyperfish in June last year. Its partnership with US-based sales and marketing firm N3 has also proven highly fruitful in building the sales pipeline. This content is produced by Star Investing in commercial partnership with LiveTiles. This content does not constitute financial product advice. You should consider obtaining independent advice before making any financial decisions.